Steven (Chicagoland, United States) on 1 April 2014 in Animal & Insect and Portfolio. Captured at a rest stop along the Pacific Coast Highway. Wonderful animal shot with a story. Well done. Of course dear, how cute you are ! One of the best squirrel shots around ! Superbe photo, trop beau ce petit écureuil ! Terrific timing and cute capture! Great, very great. Well done ! 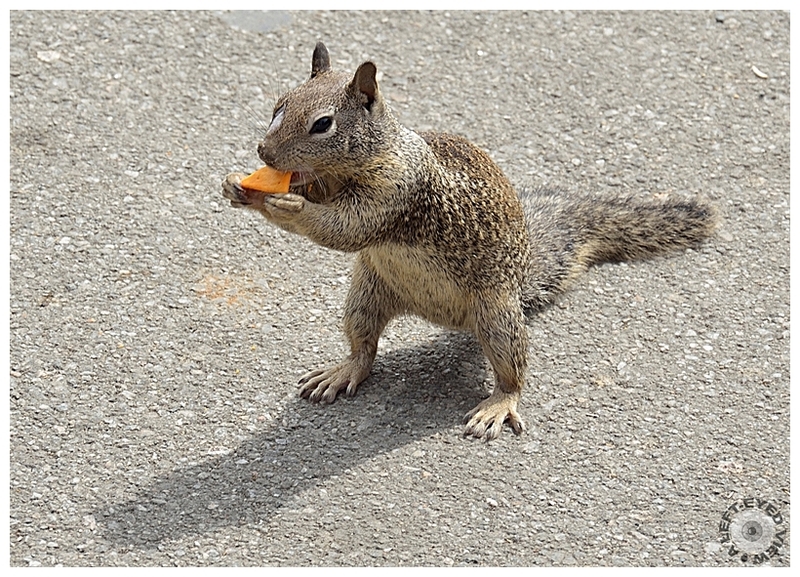 A fine "catch" of this squirrel chewing away on a goodie. Fine St. shot. Happy ST - I never saw a squirrel with his toes spread like that before! so cool shot dear Steven! What a great photo. Happy ST. How'd you get him to pose for you!!!! Fed him, I guess? @LauraS: Oh no! Signs everywhere stated "Feeding the animals is prohibited." The woman was feeding them like there was no tomorrow. Those guys are happy with any tidbit. That's a very cool capture of this cute pest. I love it! You take the best squirrel pictures! This is hilarious! Happy ST! I don't see a glass of wine anywhere. Cute little critter, and friendly, too. Though I might be friendly for a bite of cheese cracker. Lovely image of a cute squirrel ! I like his(her) standing pose during eating. That is probably unique.